Contact Joe Newman at joe@focusonthestory.org to join the waiting list for this trip. Read our payment and cancellation policy. Because you’ve never been there before. 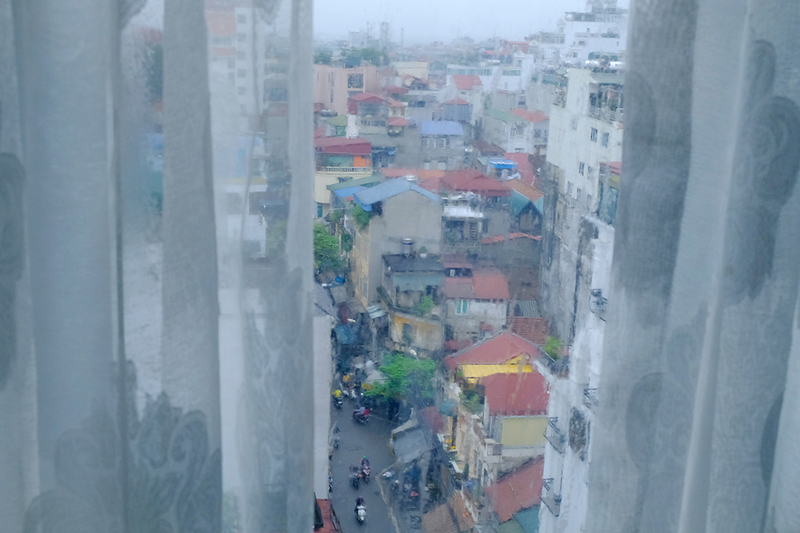 Because Hanoi is a legit, you-are-not-in-Kansas-anymore Southeast Asian experience: chaotic, traditional, alluring, friendly and not overly westernized. Because you’ll have the best $3 meal of your life. And the next day you’ll top it. Because Vietnamese coffee (seriously). And because Vietnamese coffee with a raw egg. (Oh yes, you will.) 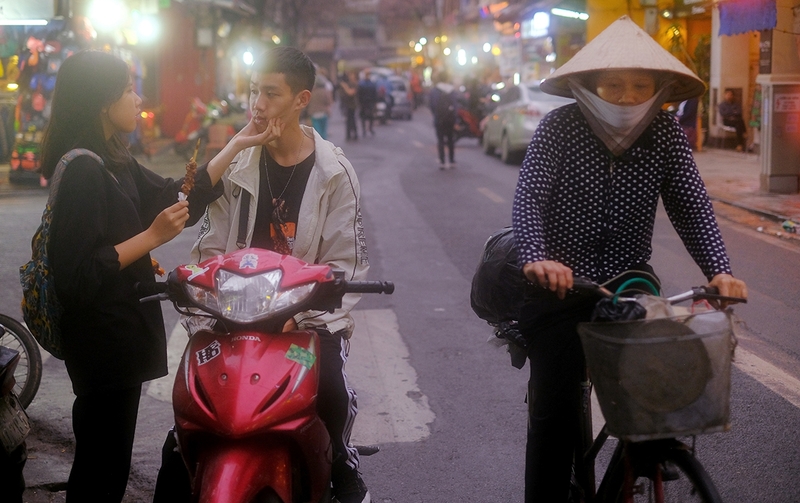 Because being a street photographer in Hanoi is like being a mosquito in a nudist colony. 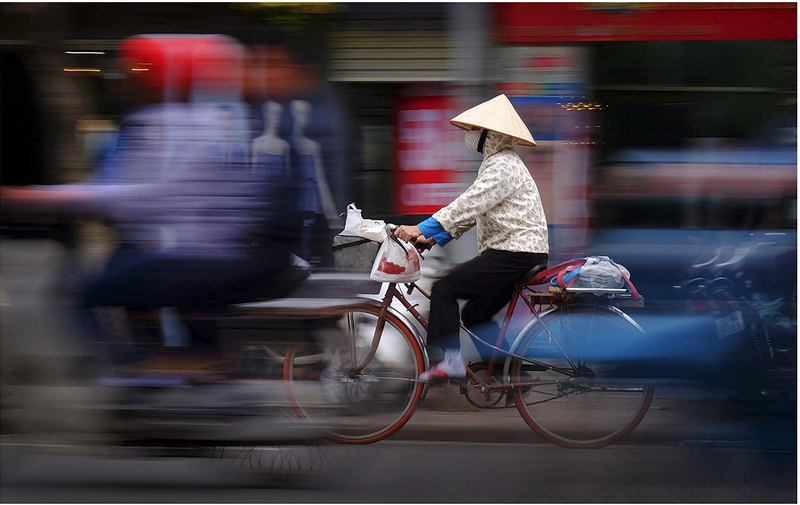 You’d be hard-pressed as a photographer to ﬁnd a city more compelling to explore than Hanoi. It’s the historic capital of Vietnam, and boasts a thousands years of history. 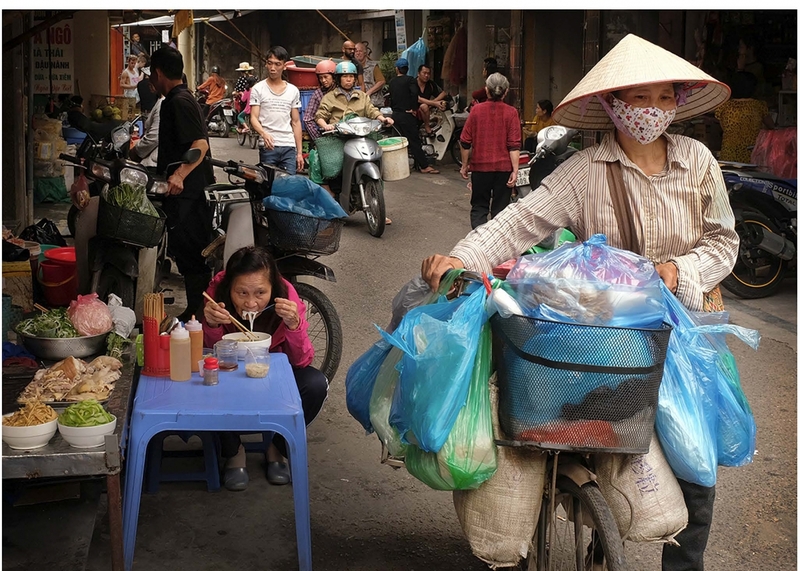 Hanoi is a city in transition. Now is a fantastic time to visit; to witness and photograph the spirit and heart and resiliency of its people. In a world that is quickly becoming homogeneous, Hanoi is still wonderfully unique and interesting. 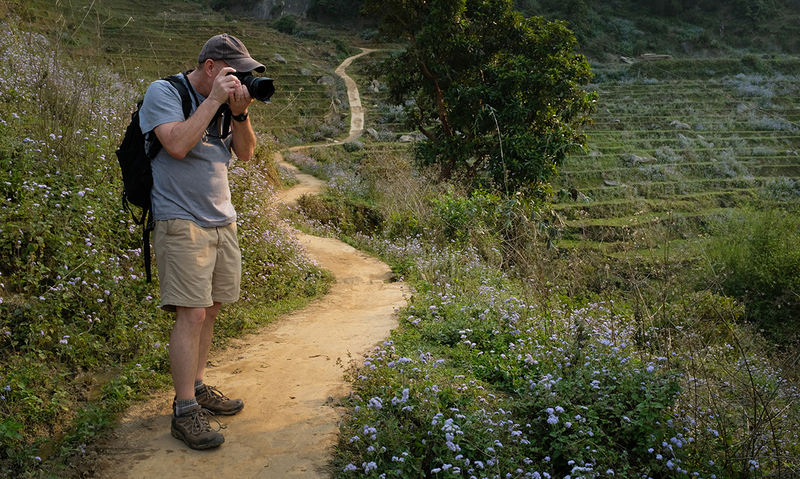 Our photo workshop, led by David Hobby and Hanoi-based producer Thu Hoai, is designed to help you grow both as a traveler and as a photographer. You’ll learn to approach travel more like a working photojournalist, using your camera as a catalyst to better understand another culture. Vietnam is not a wealthy country. The economic constraints on display are hard to miss. But so, too, is the ingenuity and can-do approach. Where just a few years back bicycles were the norm, scooters have taken over. This is a city of young and ambitious people reaching for a better future. You you would be wise not to bet against them. * Trip pricing includes round-trip airfare between Los Angeles and Hanoi, Vietnam entry visa, nightly single-occupancy accomodations in Hanoi, daily breakfast, airport transfers, three group dinners, transportation and group lodging on our mountain village excursion and 8 days of hands-on instruction with workshop leader David Hobby. David completed more than 10,000 assignments in his two decades as a staff photojournalist before leaving The Baltimore Sun to found Strobist.com. Over the past 12 years, he has led workshops all around the world — including teaching for Santa Fe Workshops in Cuba and Mexico and launching the X-Pedition travel workshop series in January 2018. This will be his 15th trip to Asia. 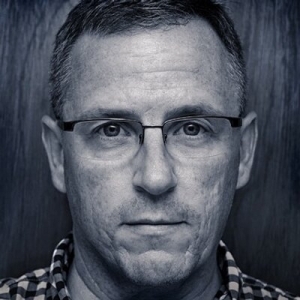 In 2014, David created the video series The Traveling Photographer, for Lynda.com. Shot on location in Hong Kong, Dubai, London, Paris and New York City, The Traveling Photographer teaches photo enthusiasts how to travel with the heart of a vagabond and the eye of a photojournalist. 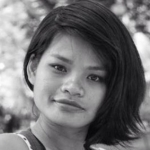 Thu Hoai is a professional photo/video producer and lifelong Hanoi resident. Which means that she, a) understands the needs and priorities of photographers, and b) knows Hanoi and northern Vietnam like the back of her hand. Any seasoned journalist knows that your efficiency when working in a far-flung city is greatly improved by teaming up with a local “fixer,” as such producers are often called. We are very lucky to have Thu serving in that capacity for our trip to to Hanoi. If she can’t find it, get it or arrange it, suffice to say she knows someone who can. Our group is limited to 12 participants, which allows for both individualized instruction and sufficient time to get to know your fellow travelers, both through small-group shooting excursions and full-group nighttime social outings. Our itinerary is crafted to give you the most complete photographic experience possible. In addition to daily classes and editing sessions, we reserve generous amounts of “on your own” time for shooting and exploring the city. 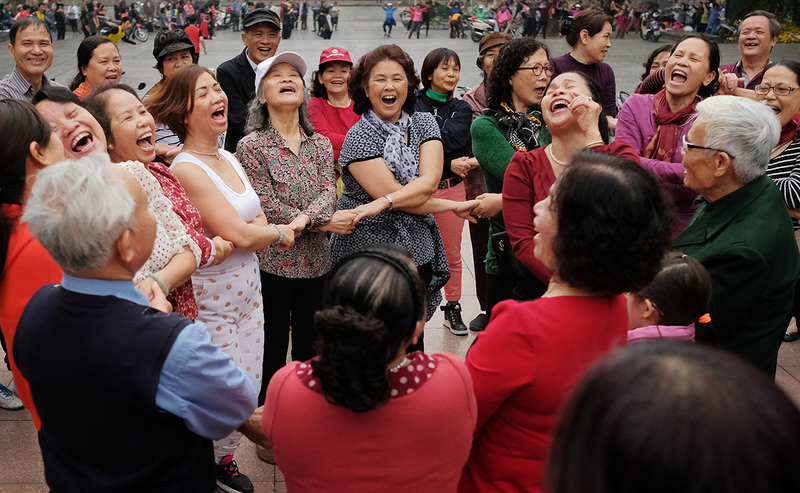 Hanoi, where we will base, is both frenetic and vibrant. 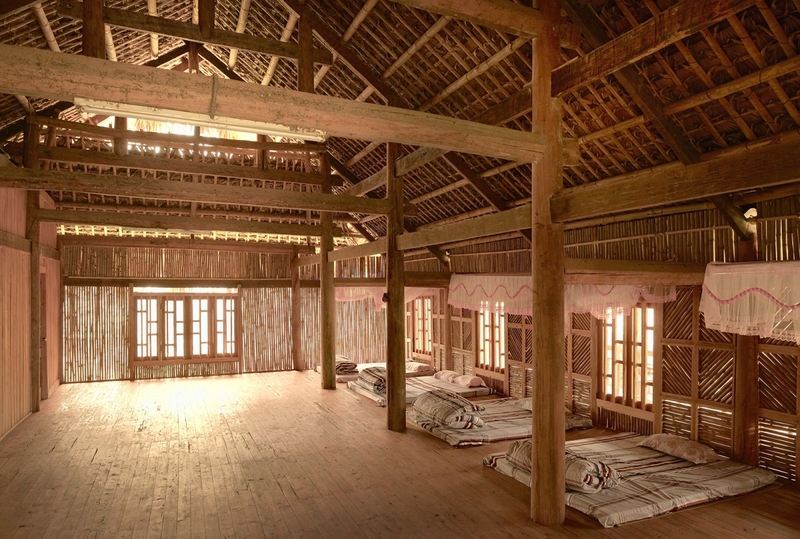 But your trip also includes an overnight excursion deep into rural Northern Vietnam. We’ll stay in a small farming village about 15 miles from the southern border of mainland China. Here, you’ll experience a culture steeped in tradition and hard work as our visit is timed to the end-of-summer rice harvest. More info on this excursion in our FAQ section below. This is not a tourist bubble experience. You’ll learn to stretch yourself as a traveler, and gain the conﬁdence and experience to travel to a wider variety of destinations. Our onsite classes typically are held in late morning, when the sun has climbed higher in the sky after the earlier hours better reserved for shooting. The ﬁrst two days are devoted to a fresh look at the harder, more traditional photo skills. This will help you to improve your photos both technically and artistically. Day three will focus on the (frankly, more) important soft skills of integrating yourself into a scene. On day four, we shift our focus to learning to be a better and more efﬁcient — and more conﬁdent — traveler. It’s a big world, with many amazing places to see. Why limit yourself to the same short list of popular cities already homogenized by mass tourism? Out-of-the-bell-curve destinations are less touristed, less expensive, and can be vastly more rewarding. Finally, for our ﬁfth class we’ll pull back to take a 50,000-foot view of photography as a catalyst. How do you better integrate your photography with who you are as a person? How do you differentiate yourself from the crowd? How can you leverage your photo skills with your other expertises to do things others have not yet thought to do? It’s a deep dive. You’ll learn how to adjust your priorities with the rhythm of the day (and night) to maximize both your personal and photographic experiences. We’ll always be out shooting around the edges of the day — and especially at blue hour — when the city is at its visual best. When the midday sun lowers your photographic odds (well, unless you are Alex Webb) we’ll be indoors with classes and editing. 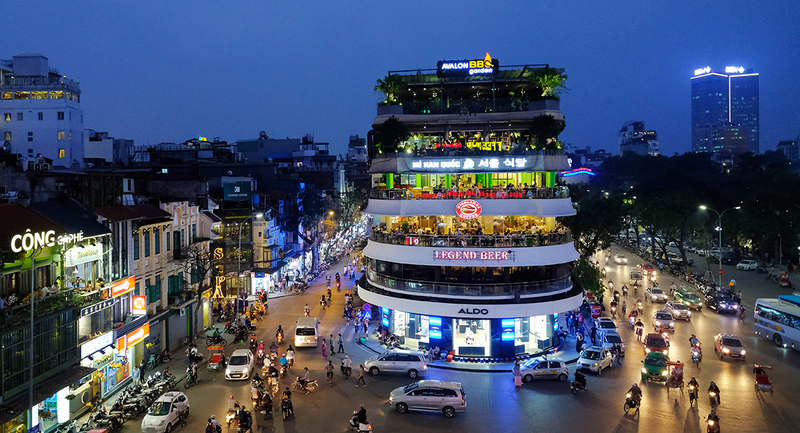 After dusk, we’ll turn our attention to the vibrant nightlife Hanoi offers: seemingly the whole population comes out on the streets. And that little six-by-ten-foot T-shirt shop you remember from earlier this afternoon has now somehow morphed into a mini bar. And yeah, you’ll bring your camera. But a big part of successfully coexisting with your camera is also knowing when to put it down. Don’t forget to just experience the trip. Speaking of cameras, Focus on the Story’s X-Peditions are unique for another reason. 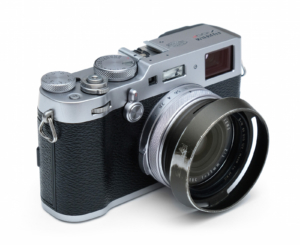 The name itself is a nod to Fuijﬁlm’s X Series cameras. Small and lightweight, but with fantastic image quality, Fujis are ideally suited for travel photography. Do you have to shoot Fuji to come along? No, you don’t. But no matter what your camera brand, we will stress the beneﬁts of traveling light. We want you to learn to be more conﬁdent, and less encumbered. Every possession is a burden. And nowhere is that more true than when you are traveling. Working with less gear on the road is a blessing. It’s more culturally respectful, and safer. Most important, a neckful of cameras should not be the ﬁrst thing your subject notices about you. You want to be seen as a person ﬁrst, a photographer second. Your camera is a black box that records selected brief moments that happen within your experiences. To upgrade your photos, don’t focus on the gear. Focus on the experiences. From our point of U.S. departure at Los Angeles International Airport, it will take us two calendar days to reach Hanoi. It’s really one long day, chronologically, but crossing the International Date Line costs another day on the calendar. (You get that back on the return trip.) Thus, our ﬁrst day in Hanoi is day three of the trip. We’ll base in Hanoi. Days three through ﬁve will be spent there, with classes and edits and lots of shooting/exploring time. 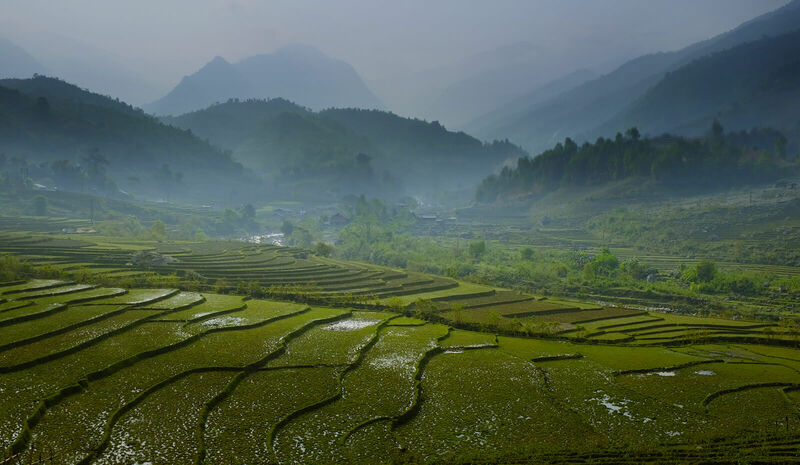 Next, we’ll travel overnight to the frontier city of Sapa, and then into the mountain hinterlands to our farming village. That trip will cover days six and seven. There are no classes on those days, as our schedule is tighter than when we are in Hanoi. On days eight through 10, we will be back in Hanoi, including classes on days eight and nine. This will be the weekend, when the city really comes alive — especially at night. Just south of our hotel, the area around Hoan Kiem Lake is cleared of trafﬁc and taken over by pedestrians. Similarly, north of our hotel, the area is converted into a giant pop-up bar and restaurant crawl. There’s hardly a better way to spend an evening after a day of shooting. On day 11 we reluctantly head to the airport, arriving back in the U.S. on day 12. Throughout our days in Hanoi, you are welcome to choose from our suggestions on where to explore. Or strike out on your own — especially if you have discovered a good story to shoot. 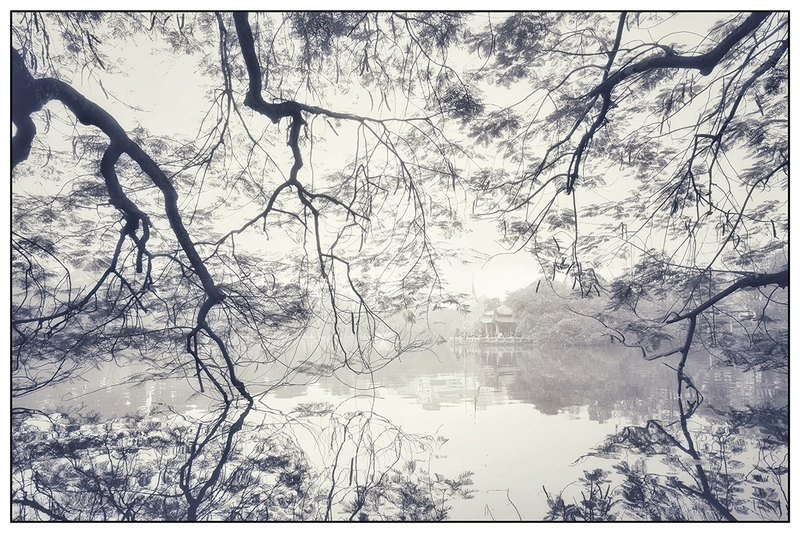 Hanoi offers much to a wandering photographer. The daily din of life unfolds on the streets. You can shoot early morning ballroom dancing at the lake. Or laughter yoga in the park. Or Hanoi’s famous water puppet shows. Or explore the endless warrens of back streets and alleys. There will generally be plans available for the evenings, be it full group or small group. Hanoi is full of interesting bars and restuarants. Tadioto, ﬁlled with local legend Nguyen Quy Duc’s incredible artwork and design, is one of the coolest spaces we have ever visited. 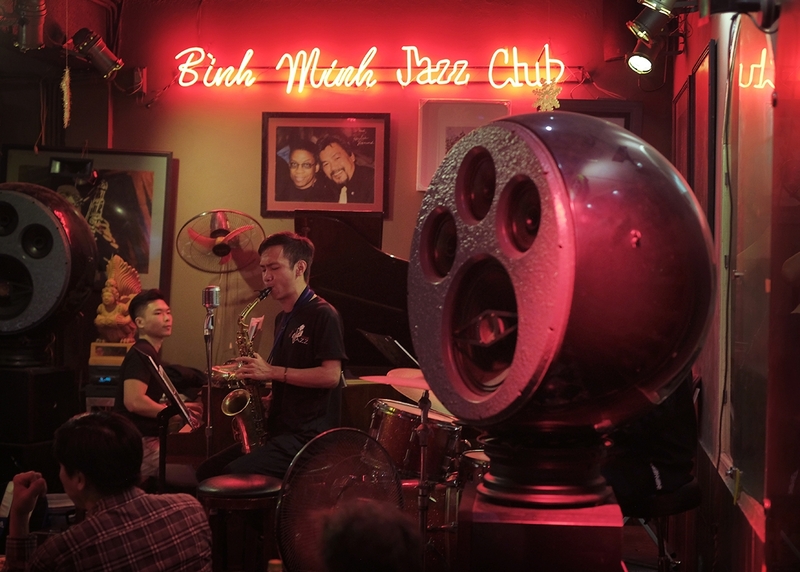 For music afﬁcianados, Binh Minh’s Jazz Club awaits: Great music, no cover, reasonably priced drinks and a light level low enough to challenge all but the most determined photographer. Not up for a trip out? Take the elevator to our hotel’s rooftop bar and trade edits with your traveling companions. Our ace in the hole is Thu, our local producer. She is always on the prowl for behind-the-scenes looks at Hanoi. 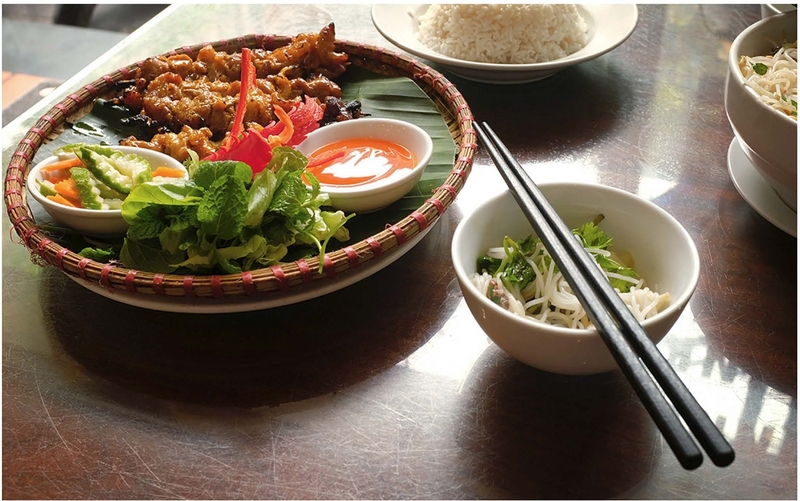 Perhaps you’d like to spend an hour or two learning to cook a traditional Vietnamese dish? She can arrange that. Roundtrip airfare to Hanoi, Vietnam from Los Angeles, CA will be part of the package. You are responsible for getting to the departure city in time to make your connections, including the cost of any necessary overnight accomodations in Los Angeles. What if I am not leaving from the U.S. or I want to fly a different airline? No problem. If you live in Europe or Asia for instance, it would not make sense to come through the U.S. You are free to arrange your own air transportation and entry and meet us at the hotel. Likewise, if you have frequent flyer miles on a different airline, you may prefer to use your miles to book your travel. In either case, we will discount your costs to reﬂect the price of the roundtrip flight from Los Angeles to Hanoi. And we will advise you on securing a visa, if needed from your country. What are the group flight plans to Hanoi? We will finalize our Hanoi flight arrangements at least six months before our departure date. Our flight information will be confirmed well ahead of the window of time for you to get the best prices for your domestic travel to our departure point in Los Angeles. Our top priority will be to choose from among highly-rated airlines with a strong safety record, and then to optimize for layover, arrival and departure times. There is stiff competition out of LAX for Asia routes, so our options should be good. To avoid scheduling conflicts, please do not make your travel plans to LAX until we finalize our flight to Hanoi. We will keep you up to date and well informed as our flight arrangements take shape. We will stay, single occupancy, in a comfortable hotel in the Old Quarter. The hotel is in a tourist district, which means it is very close to most everything of interest. Also any necessities are easily accessible. But a short walk quickly puts you in the more native areas of Hanoi. The hotel has WiFi. What about our excursion into the mountains? Having traveled all the way to Hanoi, we will take the extra effort to push far into rural Vietnam to get well off of the tourist trail. This two-night trip is optional, but included and recommended. Our excursion will be significantly more spartan than our stay in Hanoi, but also very rewarding. We will leave Hanoi in the evening to take an overnight train to the frontier town of Sapa, far into the Northwest region of Vietnam. We’ll be traveling in a vintage sleeper car, in which the mattresses can charitably be described as “firm.” But the train is considered to be the safest way to make the overnight journey. After disembarking in Sapa before dawn, we’ll transfer to private vehicles for the 3-hour ride into the mountains. We’ll arrive in the mountain village of Nam Sai in late morning. We’ll be staying in the valley seen in the photo at top on this page. You are welcome to explore the valley, and photograph the terraced landscape and farmers harvesting the summer rice crop by hand. You can hike over the hill to the next village, or relax on the balcony overlooking the river. Later, we’ll eat together, family-style, and the retire to a well-earned night’s sleep in bamboo lodges such as the one pictured above. The next morning is on-your-own photo time in the valley (get up early for the good light) and then we are off again in the early afternoon. We’ll truck back to Sapa and then take a private minibus back to Hanoi, returning to our hotel by bedtime. This overnight trip is by no means luxurious. But it is also a glimpse into the untouristed regions of Vietnam, and an eye-opening experience both culturally and photographically. If you prefer to stay in Hanoi over those two nights, that’s perfectly fine. But we strongly encourage you to take advantage of this overnight adventure. What about cell / data? Personally, we prefer to have mobile data when visiting other countries. While it is possible to get a prepaid SIM card and local number for your trip, this is not really necessary. We suggest renting a WiFi pocket hot spot for the duration of your trip. They are about $5/day, and well worth the cost. The rental company will have them waiting at the hotel on the day you arrive. The coverage is reliable throughout Hanoi, and even useable (if a bit spotty) in our remote mountain village. We will send further instructions before the trip for those who wish to rent one. In Vietnam, the food is definitely a high point. It is delicious, nutritious and inexpensive. Traveling in developing countries in an exercise in learning to manage the risks in order to get the most out of your experience. This approach is especially relevant for food. You’ll learn several strategies to help to minimize any associated risks, both on this trip and on future travels. In Vietnam, vegetarian options are available but they are not ubiquitous. So you should be prepared to be a little more diligent and/or creative. Please feel free to reach out to us with any specific questions. Caveats aside, for most people who visit Vietnam, the food is seen as an overwhelmingly positive aspect of the trip. What photography skill level is required? This is a great trip for photographers of all levels. For intermediate and advanced photographers, our role is to help you improve your skills and to open new, unexplored directions for your photography. For beginners, we’ll go slow and there will be plenty of time to talk about process — how to compose your shots, what the best camera settings are for the situation and how to get over any nervousness of doing street photography. Can I bring a non-photographer +1? Unfortunately, we don’t allow +1s who are not participating in the workshop. On this trip, we seek to adopt the mindset of working photojournalists. Even under the best circumstances, the spouse/signiﬁcant other/friend will alter the group dynamic for everyone involved. Gear is a very personal decision and really depends on your personal style and what you hope to get out of the trip. We’re shooting and teaching with Fuji cameras. But the most important thing is to learn to travel light and shoot unencumbered by excess gear no matter what your chosen brand. Bring a camera you are familiar with. For street photography, most photographers will beneﬁt from a 35mm or 50mm full frame lens, or the equivalent focal length on a smaller chip. For the landscapes and/or rice harvest on our trip to the farming village, a wide lens and a telephoto zoom will probably be helpful for you. This trip will not focus on photographic lighting. If you want to bring a ﬂash, that’s ﬁne. But it is not at all necessary. Photographers with less experience tend to bring more gear, often way too much. In truth, there is an opportunity cost to having either too much or too little gear. But as your experience grows, you are likely to winnow your kit down further and further. We’ll talk about this issue speciﬁcally, and at length in the months leading up to the trip to help you make appropriate and informed choices. The bottom line is that this is your trip and the ultimate decision on how much gear to bring is entirely up to you. But we are happy to help you decide. That’s a fair synopsis, and applicable to most places. To that we would add that situational awareness, and how you act, goes a long way toward reducing the risks of walking around any city with a camera. We’ll talk about that more on the trip. Much as with food, we also acknowledge the counterargument. You will incur risk from the moment you get into your car to drive to the airport to ﬂy to Hanoi. Learning to intelligently balance and manage the risks and rewards of an experience is a core skill for any traveler. How much walking does the trip involve? Is it strenuous? Our main focus during the day will be exploring Hanoi on foot with our cameras. Fortunately, Hanoi is very flat and you can always grab a seat and rest in a coffee shop as you watch the world go by. On our excursion into the mountains, the valley where we will spend the night is also relatively flat. You’ll be wandering on foot via roads and paths, surrounded by the ongoing rice harvest. Should you choose, you can take the ~30-minute walk over a ridge line via a fairly steep dirt road to the next village over. This is moderately strenuous for a healthy adult, and is by no means required. You may prefer to stay in our valley and/or relax by the river. The total for this workshop is $4,299. Participants can reserve their place in the workshop with a $500 deposit. The balance must be paid in full before May 1, 2019. Focus on the Story reserves the right to cancel workshop reservations that are not paid in full by the due date. Cancellation by Close of Business (COB) April 30: Refund of amount paid, minus $500 cancellation fee, plus cost of any air travel booked in your name, if any. For this trip, we book your roundtrip flight to Hanoi immediately after your workshop is paid in full. Cancellation by COB June 28: Refund of amount paid, minus 40 percent cancellation fee. No refund available for cancellations on or after June 29. Please note in the event of a cancellation, you are responsible for contacting the airline to receive any potential refund or transfer of unused flights for tickets purchased in your name. There are no exceptions to our cancellation policy.